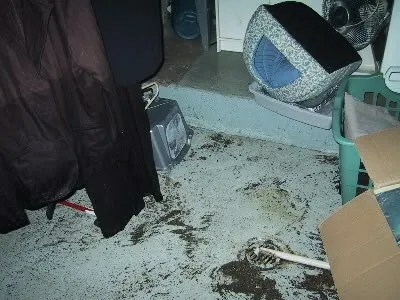 The Great Flood of 2007… also known as the nightmare that is my life… also known as Muddy Waters Run Deep… you guessed it, my basement is a swamp. Started the cats’ dinner, got them their medications, swept the floors… when I noticed I was hot – really HOT. Checked the thermostat and it’s 84 degrees. Realized there was no air coming out of the vents. Went downstairs to check it out. Next thing I notice in the dim light is a litterbox at the base of the stairs – that’s odd. Some boxes overturned – odder yet. Now I realize it’s wet. REALLY wet. Up to the third stair of the stairway. It looks like a mud bomb has gone off in the basement. It’s not just a matter of boxes being a bit damp on the bottom. Boxes, plastic storage containers, chests of drawers – they’re all overturned, filled with water, contents spilling out. Things have floated all over in disarray. 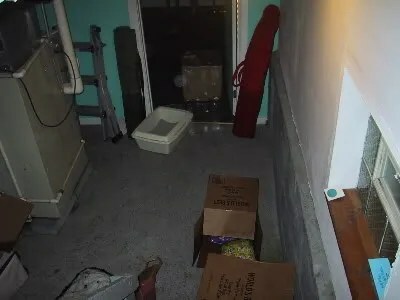 Furniture that had been in the finished rooms has floated out into the middle of the basement. Everything is filthy and WET. There’s water and mud all over the floor – and, as I noted, inside the boxes and storage containers. It’s a disaster. I call my friend and cry on her shoulder, repeating “MY LIFE STINKS” about 500 times while I try to clear a path to the fuse box. My friend, good friend that she is, listens to how my life stinks 500 times and agrees with me. Thank God, as she pointed out, I hadn’t been fostering. There were no cats in the basement. As awful as the mess was to come home to, at least I didn’t come home to a traumatized cat sitting in a windowsill or worse, drowned kittens. I’m relieved I didn’t come home to see my cat Omaha sitting in a litter box, floating amongst the wreckage. So, I called the insurance company and I really don’t need to be forking out the money for my very large deductible, but for the moment I’m happy that it’s in their court as I cannot deal with it right now. I can’t even guess where one would start wtih the giant water-logged muddy mess. 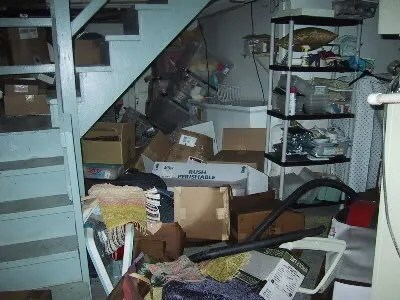 I can’t bear to find out how many of my scrapbooks or picture albums, all stored in the basement, are ruined. I don’t want to know how many of the supplies I stored for Feline Outreach (the not-for-profit I co-founded) are ruined. I can’t think about how much inventory for Mousabilities (my little side business) is damaged. I don’t want to look at the once-clean laundry I had in the laundry basket and hanging to dry. I want to be oblivious to it all. I think an alcoholic beverage will help. Pity party at my house, all are welcome!